Our average home attendances are currently our highest since 1972; in recent years we have exceeded 1000 fans on numerous occasions. Our combined attendances at Vauxhall Road throughout a season is around 15,000, with programme sales around 25% of that total. Hemel Hempstead Town is currently enjoying the clubs best form in its 132 year history, having won the Southern League Premier Division title in 2013/14 and securing promotion to the Conference South – which is the second tier of non-league football, consisting of a mixture of professional and semi-professional clubs. Our average attendance has doubled in recent seasons, thanks mainly to the appointment in 2012 of ex-professional footballer Dean Brennan as Manager, whose influence in gaining the signatures of some the countries best semi-professional players has changed the clubs fortunes dramatically. 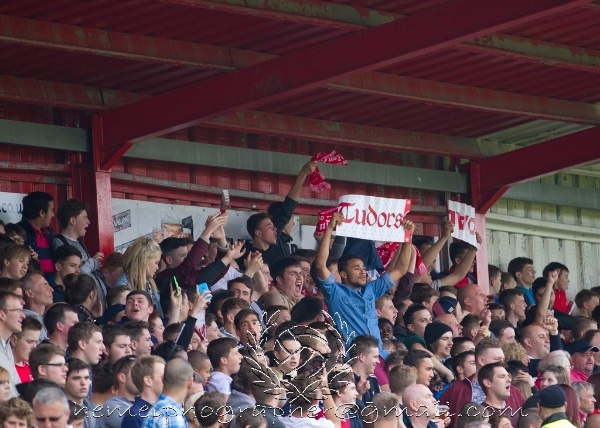 We’re aiming even higher and believe that regularly hosting over 1000 fans is achievable; not only are National League South clubs better supported, but there is less travelling in this division with relatively local fixtures against St Albans City and Wealdstone among numerous opponents based in and around London and the South East. As part of necessary ground improvements in accordance with regulations at this level of football. It’s an exciting time to be involved with our football club. The official club website achieved 92,494 total hits in April 2014, with 8,363 on one day alone when The Tudors lifted the Southern League Premier Division winners shield. Over the duration of the 2013/14 season (August 2013 to April 2014) the site had 529,126 hits. We have a club photographer providing action shots for our website and social media. Our football club has gained extra exposure by appearing alongside our sponsors at local events such as the Herts Country Show, the grand reopening of Hemel's Old Town and Dacorum School Sports Network Family Fun Day. We also add details of our partners to our website, including links to their websites, at no extra cost and we're happy to interact via social media to promote companies and feature any deals/events on Twitter/Facebook. We're currently exploring the idea of hosting business networking events for our sponsors and advertisers at our football club. Hemel Hempstead Town is not a greedy football club; we offer sponsorship and advertising to suit every budget, from local sole traders to large international companies. We want our partners to benefit from working with us and get value for money. 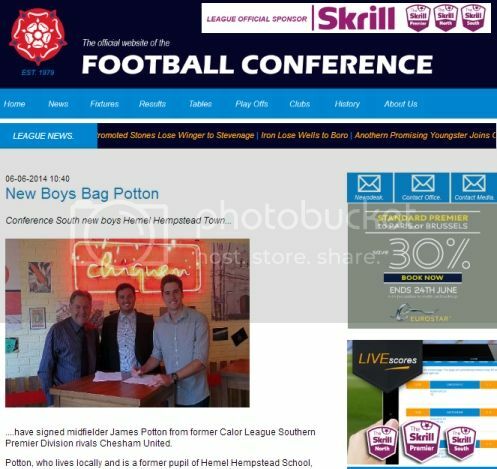 For example, when we won the league title in May our squad visited various sponsors with the 2013/14 Southern League Championship winners shield for photo opportunities and one of our sponsors at Chiquen bar/restaurant were featured in local and national press (as illustrated below) when one of our new signings was unveiled there. We actively engage with our partners; via social media and match day announcements we encourage our fans to use the services of our sponsors and advertisers. Our current main shirt sponsor is Underwoods Solicitors; Kerry Underwood has written a testimonial in regards to working with the club which is featured here.